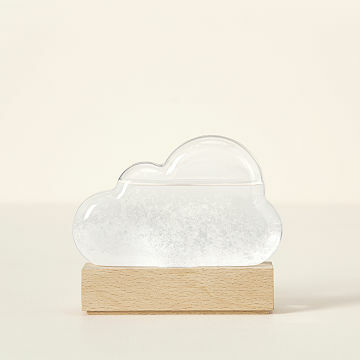 This glass cloud contains liquid thought to predict the weather by crystalizing in different patterns. Nobody knows who invented the "storm glass"ancestor of this charming cloudbut it was popularized by pioneering meteorologist Robert Fitzroy, captain of HMS Beagle. (He coined the word "forecast.") This playful interpretation works the same way they did back then. Special liquid inside the glass crystalizes in patterns believed to predict the weather: fair, cloudy, rainy, windy, or stormy. Fitzroy used his while carrying Charles Darwin on his famous, five-year voyage. Sitting on your desk or windowsill, yours can accompany you on side trips to Planet Weather Nerd. Designed in the United Kingdom. Made in China. Cloud should be handled with care and kept out of the reach of children. Keep away from heat, sparks, or other sources of ignition. Place the storm cloud in an area of your home that is not subject to sudden temperature changes. Keep it away from heating or cooling vents and out of direct sunlight for the best results. When you receive the storm it will be in the state of disruption and may take a week or more to settle into its new home. When the liquid is clear, it is ready to go. Slowly as the storm cloud adjust to the room temperature, white matter will begin to appear out of the solution. If you notice after a few hours that the white mass is at the top of the cloud, shake it gently and set the storm cloud back on its stand. Leave the cloud undisturbed and it will start to predict the weather. Great little conversation piece. I enjoy waking up to it everyday. Cute little cloud! It's well designed and once it acclimates, it will start to "predict" the weather. The weather where we live changes by the minute, so very little bit helps. Not sure of the accuracy, but it sure is pretty!! Very cute gift item! Absolutely love it on my desk at work.